As I mentioned on Sunday, I developed some tooth pain over the weekend. Coincidentally, I had seen an oral surgeon a few days earlier to confirm that I have to have my two upper wisdom teeth removed, but that there was no urgency. Upon consulting with my dentist today, he found the problem with my right upper wisdom tooth, necessitating a quick - tomorrow morning - appointment to remove the two teeth. I'm not looking forward to that and am tomorrow to eat soft and cool items, like soy yogurt, smoothies, and sorbets. So, I made something that I may not be able to eat for a few days, including half of a large carrot (which I handled fine!). I started some jasmine rice going as a pilaf; in a little canola and Mongolian Fire oils, I sauteed a little bit, maybe 3 or 4 tablespoons, of medium chopped onion (maybe 1/2" pieces) for a minute or so, then added a little (1/2 teaspoon or so) finely chopped ginger and, a moment later, rice. I stir fried the rice for just half a minute or so till the rice grains went from white to clear, added 1/2 teaspoon or so of cumin, and, maybe 15 seconds later (being careful not to burn the cuming), added water in a ratio of 1.5 to 1 rice, plus a vegan bouillon cube and a pinch of turmeric. I brought this to a boil then simmered, covered, for 20 minutes. 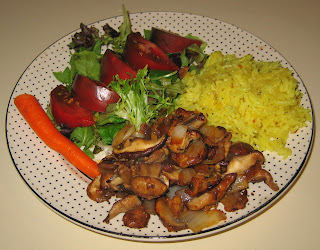 In the meantime, I sliced cremini and shiitake mushrooms plus a sweet organic Vidalia onion. I also chopped about 1/4 of a package of tempeh into small pieces of around 1/4". I sauteed the onions, added the tempeh a minute later, and added the mushrooms a few minute later. 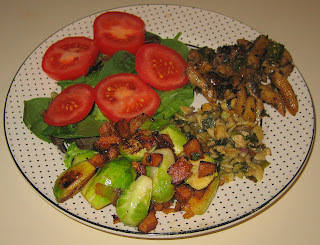 I sauteed till the tempeh was brown and the mushrooms cooked down. I added a little soy sauce at the end. We enjoyed dinner! Yesterday we were with a friend in Raleigh and wanted to treat him for some assistance he had provided, so went to a relatively new Indian restaurant that my wife and I have been meaning to try, Azitra Restaurant. We normally avoid North Indian restaurants, finding them overspiced and not so authentic, but this one is more a gourmet one with some unique dishes, we had heard. We enjoyed the experience - very nice, upscale decor and tasty food that was subtly (except for one dish) spiced. We'll return! Tonight, I had a hankering for rice noodles. Also, I developed some tooth pain last night (we were at a wedding and as I bit into a vegan sandwich, one of my teeth started hurting :-( ), so wanted to eat rather soft food. I made a saute of squash (patty pan and, actually a zucchini, gold rush) and okra, then added Pluto's Caribbean Bliss seasoning and salt. I served this atop the noodles. We went tonight to see Pilobolus, one of our favorite contemporary dance troupes, at ADF, but we ate before we went. 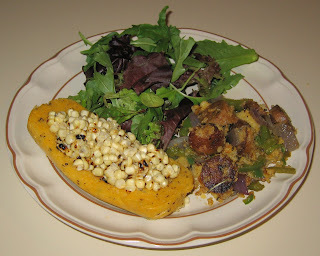 I came up with an interesting idea, using fresh corn on the cob (that I roasted and stripped from the three kernels that I had, then mixed in Earth Balance margarine, salt, and lime juice), polenta (that I had premade in a cupboard), and artisanal vegan apple sage sausage by the Field Roast Grain Meat Company. I simply cut the tube of polenta in half, scooped out each half to make it into a hollow "canoe", and baked it, uncovered, at 350 or 375°F, for about 25 minutes. I simply served the corn in the polenta (which, of course, is made of cornmeal); it was tasty. I sauteed the polenta that I had removed, after cutting it roughly into small-medium pieces, as well as slices of the "sausage", and onion. It was a good dinner! Yesterday was my photography class. My wife and I went out to a Turkish restaurant on Franklin Street in Chapel Hill, Tallulah's. We enjoyed the food and had a variety of mezze side dishes. I was surprised that the Turkish people make a warmed hummus; it was quite good! As I had mentioned in early June, my friend Puja had sent me some Vietnamese rice paper (banh tranh) rolls. 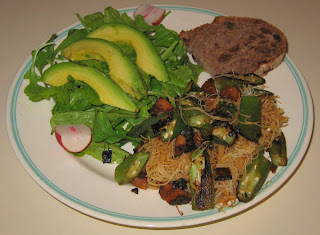 That was so kind of her and, using her ideas as a base, I tried working with them for the first time today and served them alongside a simple tempeh - shiitake mushroom stir fry with rice noodles. These rice paper sheets come in very thin circles. 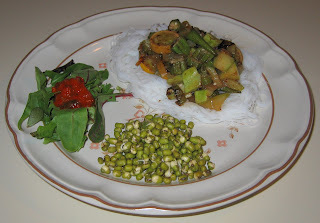 I first had all the fillings ready; I grated carrot, cucumber, and crookneck squash and laid out some mint leaves. I also prepared rice noodles by putting them in boiling water for a few minutes till they were cooked (I reserved some for the stir fry). Then, I simply took each rice paper disc and put it in a large bowl of hot tap water. I kept it in just till it was soft and pliable, maybe 5-10 seconds (much longer and it seemed like it would disintegrate or at least readily rip). Then I simply added the vegetables, mint leaves, and rice noodles and folded the paper down. I purchased an imported Indonesian peanut satay dip, and served that in a bowl for us to dip the rolls into. We loved them! I can't wait to experiment with more ways of preparing them - perhaps with some avocado?! We had eaten at Sage Vegetarian Cafe last Thursday after my photography class and had some of my wife's leftover Persian "Eggplant Paradise" stew, made with split peas, saffron basmati rice and spices. 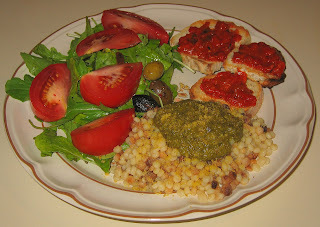 I wondered how it would taste thickened with Fregola Sarda (Sardinian Couscous) pasta. I cooked the pasta in water (I could have cooked it in broth), drained, and mixed in the cold eggplant, then gently warmed the combination, while adding 3 cloves of chopped marinated garlic, maybe 1/4 teaspoon of paprika, and a little salt. It came out great! I also opened up another one of the "Sheese" Scottish vegan cheese spreads that is labeled as similar to cream cheese. It was very tasty and creamy! 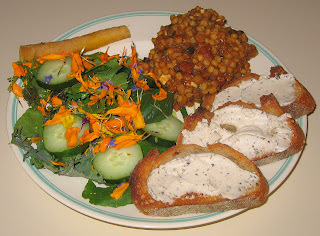 I served it atop toast; my wife avoids soy products except tempeh, so I put the Eastern European pinjur spread on hers. We had half of a yummy Hyderabadi Masala Dosa (crepe filled with potatoes and coated on the inside with a spicy mixture) leftover from my wife's birthday last Tuesday, which I heated and served without any chutney (simply because I didn't have any chutneys at home). I also made a simple but tasty and filling main course simply by chopping into large chunks a whole 8 ounce box of seitan and locally grown spring onion. I started the white of the onion sauteeing in canola oil (and later added some drops of Mongolian Fire Oil) in my cast iron pan and a few minutes later put the seitan in. I let it go for some time - maybe 7-10 minutes - so that the seitan was well done. Then I added the green of the onion, some red bell pepper, and a teaspoon or so of dried rosemary. I took it off the heat after 2 or 3 minutes and mixed in some salt. My Mom is a very particular eater and rarely eats out, except for South Indian restaurants and very occasionally at my house. She doesn't eat onions or garlic. My parents accepted my invitation to eat at my house tonight. 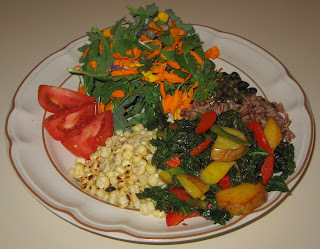 My wife and I had a nice visit to a local farmer's market yesterday, and had a number of nice items to enjoy, including green kale, a small kind of potato that is a good multi-purpose variety, and salad greens with edible flowers. I've cooked kale by simmering it in liquid, but today decided to try something different and make it resemble vegetables cooked in an Indian-like style. I cut the potatoes into 3/4" or so pieces and sauteed them in canola oil over medium-high heat slowly for maybe 15 minutes. Then I added a dozen or so drops of Mongolian Fire Oil, red bell pepper pieces, green beans cut into 3/4" or so lengths, and kale hand torn from the stems into approximately 1" pieces. I cooked for just a few minutes, then added maybe 3/4 teaspoon of cumin seeds and 1/2 teaspoon of turmeric. Another minute or so later, I served with a little salt. I also grilled three cobs of corn over the flame of my gas burner, stripped the kernels, mixed in some salt, Earth Balance vegan non-hydrogenated margarine, and the fresh squeezed juice of about 1/10 of a lemon. 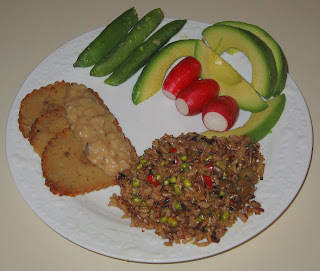 A brown rice mixture and salad rounded out the dinner that I think all enjoyed. I was looking forward to making a nice meal last night, but was called in the afternoon on another very sad infant bereavement photo assignment to the hospital. I am part of a group, Now I Lay Me Down to Sleep, of professional photographers who, totally at their own expense and with no compensation, photograph new born babies who have died or are about to die. In this case, a family with apparently no hope for their baby just born was gathering family and wanted me there to take pictures of the child on life support and (this was very painful for me to witness!) as he was taken off the support and beyond. It was sad but I think that I was able to capture memories that hopefully will help the family heal; the parents were great and very appreciative. We were at the hospital for about 4 hours - my wife came along for support and a colleague who is considering joining the group came to observe. My wife was quite hungry when we were done well into the evening, so we went out to eat at the Whole Foods Market deli. Tonight we were going to an outdoor film (the 2006 film version of E.B. White's famous Charlotte's Web - what a nice vegetarian message!) and I didn't have much time, after having to drop a friend off at the airport. Luckily, it wasn't a problem, as I remembered that we had some leftovers, including pasta from when we ate out at Panzanella restaurant this past weekend. In addition to heating (in the oven; we don't use our microwave) the leftovers, I made what turned out to be a decent dish. I chopped about a third of a box of seitan into small chunks and began sauteeing them in a cast iron pan over medium heat with a little canola oil. I wanted the seitan to get crispy, so I let it go for about 5 minutes or so. Then I added an onion that I had also cubed into small pieces. About 5 minutes later, I added halved Brussels sprouts and a little spicy "Mongolian Fire Oil". Maybe 5 minutes later it was done, with the sprouts getting slightly browned; I added coarsely chopped fresh basil (maybe a half dozen leaves), and a little fresh oregano, as well as a little salt. We have a specialty store in Chapel Hill called A Southern Season that I don't typically shop at, but I like to stock up in June when they have their annual clearance sale. I made my first 2007 sale stop today and found a number of pastas I hadn't seen before. Some of the pasta was from a family-run Italian company Rustichella d'Abruzzo that uses traditional long-drying times to make their pastas, including pastas with special, handmade shapes, and I purchased their fregola sarda (pasta abruzzese di semola di grana duro). It is a durum wheat toasted pasta that is made by rubbing (fregare means "to rub" in Italian) coarse semolina pasta and water together to make large granules which are then toasted, and is sometimes called "Sardinian Couscous". I had several ideas of preparing it like a typical pasta dish with sauce, but also trying to make a soup. Tonight, I had a late meeting with a bride-to-be and her husband-to-be, friends of mine, and her parents to discuss my photographing their (vegan!) wedding. I got back well after 10p - my wife had had a snack to tide her over, but I wanted to get dinner on the table quickly. I decided to make the fregola sarda and cooked it till al dente (the package suggested 14-17m, and I think it was actually done in 12-13 minutes), then added some pesto sauce (prepared; a few days ago I found a good looking brand of vegan pesto) and Eat in the Raw's Parma! vegan "Parmesan cheese". I also had some prepared pinjur sauce (a Macedonian eggplant and/or roasted pepper spread; quite tasty!) and put that on top of slices of toast. We mildly enjoyed the fregola sarda. I think it would taste better with a hot sauce, perhaps a traditional tomato sauce. It was a good dinner that I was able to put together in under a half hour! 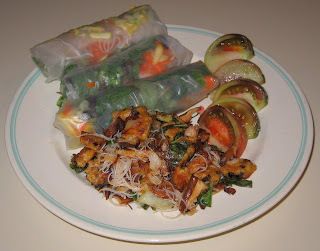 As I had mentioned two Saturdays ago, my blogger friend Puja sent me rice paper spring rolls to try out. I love Vietnamese spring rolls that have rice noodles inside of them. In assembling ingredients to give something like that a try, I purchased thin dried rice noodles on Saturday and am thinking of trying some simple marinara recipes and others with them. Tonight, I used them in an okra stir fry. I diced a little more than half of an 8-ounce package of seitan into small cubes between 1/4-1/2" and started them sauteeing. After a few minutes, I added two scallions that I had diced into 1/4" rings. Just a minute or so later, I added some lovely locally grown organic okra that I had cut diagonally into halves (a few large okras I cut into thirds). I sauteed for about 5-8 minutes, then added rice noodles (I had first soaked the noodles in hot tap water for about 6 minutes then drained them, running cold water over them); half of a red jalapeno pepper, diced into small pieces, less than 1/4"; about a half dozen basil leaves, roughly torn; a little soy sauce; and, since I was unfortunately out of fresh ginger, maybe a quarter teaspoon of ginger powder. I thought it was a good and unique dinner; my wife enjoyed it, but less than I did. Tomorrow, by the way, is my wife's birthday - though it's a big landmark one, she really doesn't like celebrating and didn't want a party, but it seems like my parents, she, and I will go out for South Indian food. We're also eating out on Thursday as a new photography class begins then. It was a hot day today, so I wanted to make a cooling-off meal featuring a substantial non-traditional salad. I roasted three ears of corn over the open flame of my gas range, stripped the kernels, and mixed in chunks of half an avocado, maybe 1/5 of a yellow onion, and 1/3 of a red jalapeno pepper, as well as a little salt, fresh lemon juice, and lime. It came out great! 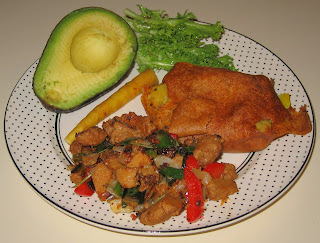 I also served jerk tempeh - I simply sauteed tempeh in little oil on a cast iron skillet then rubbed both sides of each piece of tempeh in a bowl of Pluto's Caribbean Bliss seasoning. 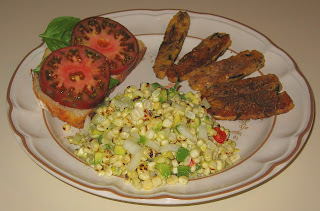 Finally, I served some heirloom tomato slices with fresh basil on warmed lemon boule sour dough bread. Yummy! Yesterday, we were out and about in downtown Carrboro, finishing up grocery shopping at 9p. It was too tempting to go, like we did last weekend, to have vegan thin crust pesto pizza at Panzanella, which we did (my wife had pasta) - very nice! Tonight was our first night at the American Dance Festival and we enjoyed a meal at home before going to the performance. I came up with the idea of roasting turnips. I peeled two turnips, diced them approximately 1/4", cut about a half dozen Brussels sprouts into six pieces (halfs then thirds of each half), diced maybe 1/5 of a medium yellow onion into 1/4" pieces, and mixed this all in a bowl with a little olive oil and rosemary needles. I roasted it in a 450°F for about a half hour and served, after mixing in some salt and pepper. 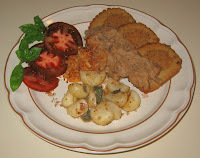 I also served some mashed potatoes with some onion, salt, pepper, Earth Balance margarine, and Eat in the Raw's Parma! vegan "Parmesan cheese" mixed in. 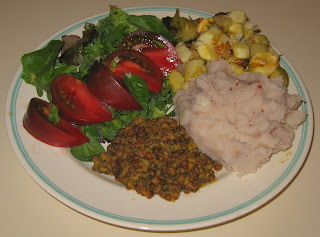 Finally, my wife had made a lentil dish several days ago, which I reheated. It was a good and filling dinner! Tonight, I made a mixture of brown rices cooked in vegetable broth. When the rice was done, I mixed in olives, as I have enjoyed at the Nicaraguan restaurant we have downtown, as well as some mung bean sprouts and red jalapeno pepper. It was good! I served it with leftover vegan field roast. While I was beginning to prepare dinner, I showed my wife a tiny radish that ended up on her plate. I joked and asked her what she would think if I served that tiny radish to her on her plate and told her that it was her dinner! I also served a dish that I had conceived earlier in the day and which we both enjoyed. I sauteed in my cast iron pan 4 or 5 stalks of green onion, diced to about 1/2" pieces, small chunks of tempeh, and, after a few minutes, leaves of baby spinach, roughly torn into approximate halves. I made some rainbow orzo simply by combining it in a ratio of one part to four parts vegetable broth and simmering for about 15 minutes till the broth was absorbed. I mixed the vegetables and tempeh with the orzo and added salt, Colgin Liquid Smoke, dill weed, a little basil and oregano from my garden, and about a fifth of a raw red onion, diced into 3/8" or so pieces. American Dance Festival opens tomorrow night and runs through July 21! We love this, the country's largest contemporary dance festival, and go to see most, if not all, of the performers. We may have some dinners out or late dinners at home on the nights we attend. Tonight we finished up the remaining leftovers from the dinner we had last Wednesday at Sitar Indian Restaurant, Durham, NC. There was an excellent 2-hour film on the Israeli-Arab Six Day War of 1967, Six Days in June, that aired on public TV (all I watch! ), so I put dinner together and we ate while we watched the film. I simply heated up the zucchini-seitan left from last week and made Road's End Organics (they make a vegan macaroni and "chreese") brand shiitake mushroom gravy that I served atop mashed potatoes. Yesterday, we were hoping to spend much of the day with our new tandem, but it rained. We nevertheless had a very nice day doing some shopping (other than food shopping, neither of us shop much at all) for bicycle clothes (we got two matching outfits!) and tools, possibly an Apple computer purchase, and some DVDs - it ended up being a little late and we were hungry, so we ate out at what we both feel is probably the best pizza in the area at Panzanella - they seem now to commonly have vegan pesto on hand! They make a very tasty pesto pizza with thin crust, which is what I had, and my wife had spaghetti. By the way, June 6th is the third anniversary of my wife and my meeting each other! I still have managed to make a unique dinner for her every night that I've cooked for her (most nights). It took us all afternoon and into the evening to get our new tandem put together (I took some pictures for the manufacturer to help guide us - you can see the images online) and before we knew it, after a fun quick initial trial ride, it was 9p and my wife was very hungry. I heated Field Roast "Grain Meat" Company's handmade stuffed (with apples, squash, and mushrooms) Celebration Roast; how relevant this turned out to be, as the first time I had tried it was about a year ago, the night before our annual rose show, and today was the 2007 show, which I didn't attend as there was no official arrangement competition). In hindsight it could have looked prettier, but I heated up leftover Potato-Parsnip Velouté and used it as a gravy. I also tried cooking with baby turnips for the first time. I simple halved them and boiled them for just 4 or 5 minutes till they were a bit soft. Then I mixed in a little Baja Lime marinade, salt, Caribbean Bliss seasoning, and fresh oregano. It tasted interesting and was reasonably good. I was delighted, by the way, to get a very nice gift in the mail from my blogger friend Puja who says she follows my blog. She sent me rice paper spring rolls along with some recipe ideas. (Thanks, Puja!!) I hope to experiment with them in the coming days. Late this afternoon, I was involved with a photo shoot at a friends' studio and stayed after to visit and talk shop a bit. 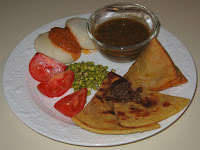 My wife was hungry when I got home, but I was able to get a meal on the table quickly as we had a lot of leftovers from our dinner at Sitar Indian Restaurant, Durham, from Wednesday night. 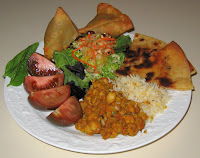 Except for the salad, the meal was really theirs - triangular stuffed samosas, filled flat bread, rice, and (too spicy, alas) chickpeas. I sauteed four cloves of roughly chopped garlic and seitan, chopped to about 1/4" cubes, for a few minutes till the seitan started to brown. Then I added 1/2" cubed zucchini and sauteed for about 5 more minutes. I added a small can of stewed tomatoes, 1/4" chopped yellow bell pepper, fresh oregano and basil from my garden, and salt and pepper; I simmered this for about 5 minutes, then served over Strozzapreti Pasta with some Eat in the Raw's Parma! vegan "Parmesan cheese" on top. 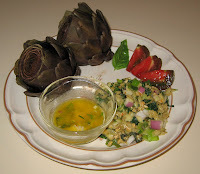 My wife and I loved this dish! Yesterday, I hosted two special guests in the class on Gandhian nonviolence that I teach. Thakorbhai Parekh, a 91-year-old gentleman who marched with Gandhi in the 1930 Salt March, joined my class along with his sweet wife and spoke to my class, came for a break to my parents' house, then joined several students and friends for a nice Indian dinner at Sitar India Restaurant (I ordered a large menu of vegan food sans onions or garlic, which Thakorbhai and his wife don't eat, including salad, samosa triangles, idli rice cakes with spicy sambar soup, dosa crepes, chana masala (chickpeas), rice, and fruit).